Boyle had bought the Maserati for Shaw after several years of frustration fielding cars at Indianapolis. 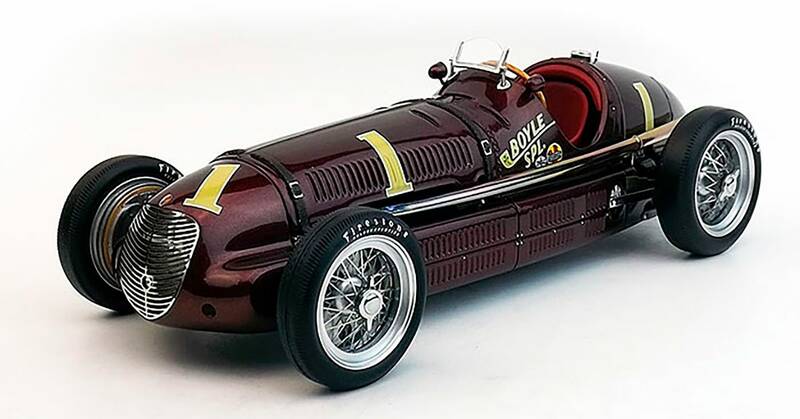 The Italian-built racer regularly raced the European grand prix circuit and claimed 365 horsepower from its 3.0-liter straight-8 engine that featured two Roots-type superchargers bolted on the engine’s nose. The car weighed roughly 1,700 lbs. and featured an aluminum body. For the 1940 Indy 500, Shaw averaged just 114.277 mph, down a bit from his win in 1939, when he averaged just over 115 mph. But the 1940 race was run under caution for the last 50 laps due to rain. 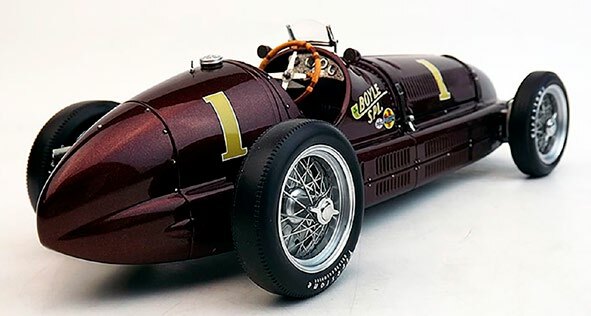 This is another stunning Replicarz resin 1/18-scale model with a beautiful body, finish and detail. Being a 1930s era racer there are plenty of visible rivets on the bodywork here, plus the one-piece hood features authentic looking leather straps. No hooks here to fumble with, but the hood features notches that neatly fit over parts of the car body to keep the hood in place. Beneath the hood, which features vents cut in the hood to cool the engine, is the Maserati’s high-powered (for the time) straight-8. Extending off the left side are eight chromed exhaust pipes that merge into the single big pipe that extends down the racer’s body to its tail. The pipes under the hood and just outside it are treated to look as if they’ve been darkened by exhaust heat. 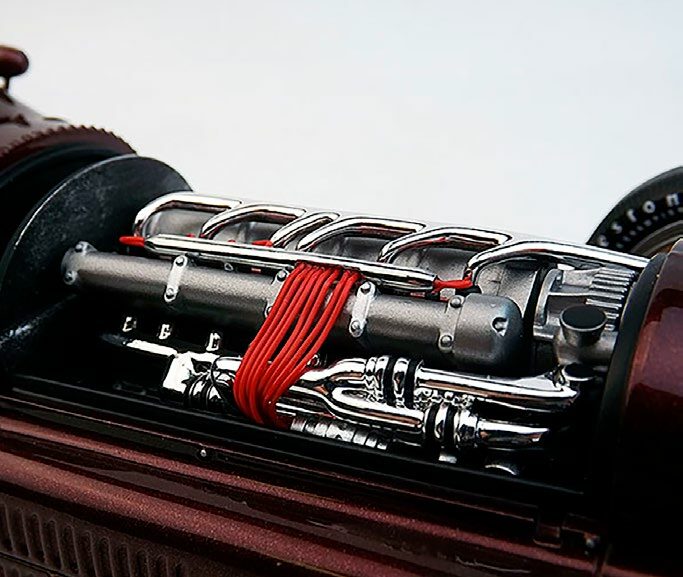 Replicarz also includes the superchargers under the hood along with spark plug wires and ignition wiring that extends back beyond the firewall between the engine and cockpit. Plus the steering column is visible. Delicate side mirrors and an equally delicate looking wind screen rest on the car’s body just in front of the cockpit. Just in back is a matte chrome gas cap on the cowl behind he cockpit. On the nose is a beautiful photo-etched chrome grille, a Maserati logo and of course the No. 1 in a pale gold on nose, tail and both sides of the hood. The Boyle Spl. logo is on the side below the windscreen along with two other race-day sponsor logos. Very few of those were used prior to the 1960s and these distinguish the 1940 model from the 1939 winner, along with the car’s number being different. 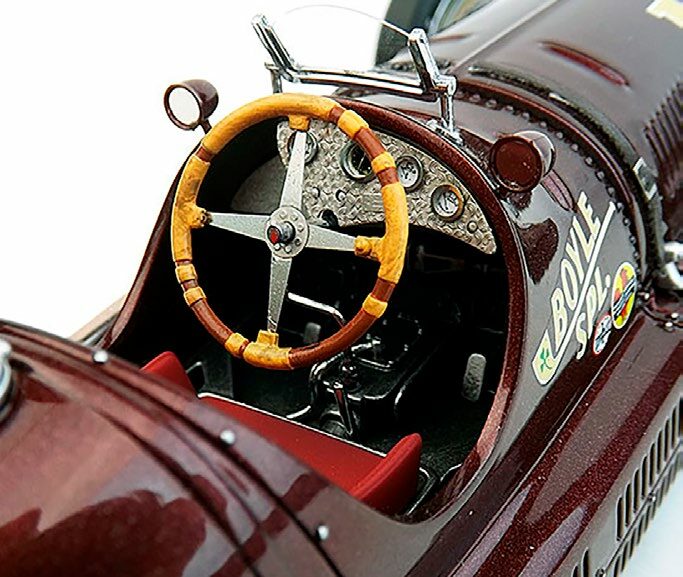 The Boyle’s cockpit is beautifully detailed with the frame being visible beneath the driver’s dark red seat and where the driver’s legs would be under the steering wheel. That’s a wood-look 4-spoke number with leather-look strips wrapped around it to project Shaw’s hand and provide better grip. Here the drive shaft runs between the driver’s legs to the rear wheels. And the shaft and gearbox are visible beneath and in front of the steering wheel. The small metal-look dash also includes four gauges with raised faces and glass lenses. Cool! If you’re an Indy 500 fan, this is another must-have from Replicarz, with more to come, including Johnny Rutherford’s 1980 “yellow submarine” Chaparral that he won his third Indy title in!